Riddell and his colleagues have refined new methods of engineering a patient’s own immune cells to better target and kill cancer cells while decreasing side effects. In laboratory and clinical trials, the researchers are seeing “dramatic responses” in patients with tumors that are resistant to conventional high-dose chemotherapy, “providing new hope for patients with many different kinds of malignancies,” Riddell said. Twenty-seven out of 29 patients with an advanced blood cancer who received experimental, “living” immunotherapy as part of a clinical trial experienced sustained remissions, in preliminary results of an ongoing study at Fred Hutchinson Cancer Research Center. The immune system produces two major types of immune reaction to protect the body: one uses antibodies secreted by B cells; the other uses T cells. 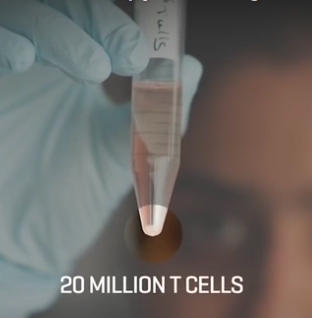 With adoptive T-cell transfer, immune cells are engineered to recognize and attack the patient’s cancer cells. Researchers extract T cells from a patient’s blood and then introduce genes into those T cells so they synthesize highly potent receptors (called chimeric antigen receptors, or CARs) that can recognize and target the cancer cell. They grow the T cells in a laboratory for about two weeks and then infuse the engineered cells back into the patient, where they can home in on the tumor site and destroy the cancer cells. Riddell’s team has recently developed a refined version of this process that increases the effectiveness of the immune response while reducing negative side effects, such as neurological symptoms, fevers, and large decreases in blood pressure. In a study published in the journal Nature Biotechnology, Riddell and his team describe tagging the potent T-cell receptor (with amino acid sequences called Strep-tag), and the resulting effect on human cancer cells in the laboratory and on a mouse model of lymphoma. “In my years as a oncologist and as a research scientist, I have never seen a treatment that has that spectacular response rate in its initial testing in patients,” Riddell said. His team is initiating trials in lung, breast, sarcoma, melanoma, and soon in pancreatic cancer. The opportunities for this technology are “incredible” and the approach has the potential to also treat common cancers such as kidney and colon cancer, he said. Funding for Riddell’s research was provided by Juno Therapeutics. * For approximately 100 years, the main tools to treat cancer were surgery, chemotherapy, and radiation therapy. But since around 2000, doctors have had access to a type of immunotherapy based on engineered antibodies that can target specific molecules on cancer cells. For example, trastuzumab (Herceptin) can be used for some types of breast cancer and stomach cancer. The new treatment approach used by Riddell’s team is based on a new type of immunotherapy using engineered immune cells to kill cancer, rather than antibodies. ** Stanley Riddell. Engineering T cells for safe and effective cancer immunotherapy. 2016 Annual Meeting of the American Association for the Advancement of Science, Washington, D.C., February 2016. *** Such as acute lymphoblastic leukemia, Non-Hodgkin lymphoma, and chronic lymphocytic leukemia. Administration of lymphodepletion chemotherapy followed by CD19-specific chimeric antigen receptor (CAR)-modified T cells is a remarkably effective approach to treat patients with relapsed and refractory CD19+ B cell malignancies. We treated 7 patients with B-cell acute lymphoblastic leukemia (B-ALL) harboring rearrangement of the mixed lineage leukemia (MLL) gene with CD19 CAR-T cells. All patients achieved complete remission in the bone marrow by flow cytometry after CD19 CAR-T cell therapy; however, within one month of CAR-T cell infusion two of the patients developed acute myeloid leukemia that was clonally related to their B-ALL, a novel mechanism of CD19-negative immune escape. These reports have implications for the management of patients with relapsed and refractory MLL-B-ALL who receive CD19 CAR-T cell therapy. Adoptive immunotherapy with genetically engineered T cells has the potential to treat cancer and other diseases. The introduction of Strep-tag II sequences into specific sites in synthetic chimeric antigen receptors or natural T-cell receptors of diverse specificities provides engineered T cells with a marker for identification and rapid purification, a method for tailoring spacer length of chimeric receptors for optimal function, and a functional element for selective antibody-coated, microbead-driven, large-scale expansion. These receptor designs facilitate cGMP manufacturing of pure populations of engineered T cells for adoptive T-cell therapies and enable in vivo tracking and retrieval of transferred cells for downstream research applications. Having survived terminal cancer with a dietary approach, what you say is too simplistic. Cancer is anything that interferes with any of the many growth inhibition pathways the prevent individual cells within the cooperative society of cells that is an animal body from growing in a fashion that puts the whole cooperative system at risk. Certainly diet, largely via its effect on our immune system, and certainly in some degrees by other mechanisms also, can play a huge role in that. The particular regime I am on is strictly vegan, largely raw, and high dose vitamin c and supplementation of other vitamin/mineral complexes in very low doses. The work in this article looks very promising, and in most people it would be unnecessary if they changed their diet and bought the contribution from animal products (meat, dairy, fish and foul etc) to below 10% of total calories. Going to zero seems to slightly reduce the risk even further, but not hugely. Along with that one needs to reduce stress (which seems to be not directly about external factors, but more accurately how we contextualise and respond to them). Immunotherapy historically has involved all arms of the immune system in experimental treatments. That includes not only trained white blood cells, but B-cell antibodies and T-cell antibodies. In some experiments they attached poisons such as ricin to kill the cancer cells.Indeed most anti-cancer drugs can theoretically be attached to antibodies to kill of cancer cells specifically.Most approaches have had miraculous cures and remissions of hopelessly ill cancer patients who were dying.They are not offered to people who have no other hope except as small treatment studies.Why? Oncol;ogy is a big medical business, to cure it outright would put Oncologists out of work.The giant pharmaceutical companies that sell super expensive drugs would lose great gobs of money.They have some of the biggest lobbies in congress to maintain their business. Often Immunotherapy of whatever form will have dangerous side effects.Some people do die from the treatments.It is unetihcal to refuse to give people who have a few weeks or minths to live a shot at these miracle treatments. 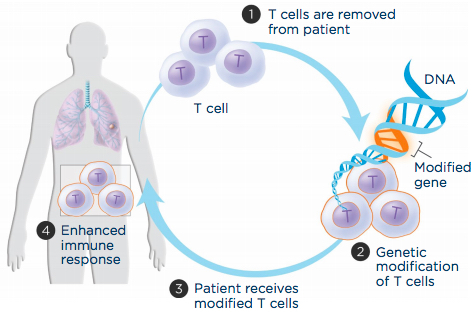 In the case of enhanced T-cell therapy such as this one it can be difficult to control how extreme the body attacks. Today they have the means to put in genetic switches which will simply turn off the T-cells or any other cell line, by turning off the genes responsible for the action.One such switch is being produced by the company Intrexon using the insect molting hormone ecdysone to stop and start the genes of any organism.There almost certainly could be analogous techniques to biochemically create similar results if we understand how this one works.— I will be dead and gone a thousand years before any of this is cheaply available to the general population. Unfortunately understanding the effectiveness of this new protocol with respect to resolving these obstacles takes time and future studies with larger cohorts. Building on years of work on developing new insulin-producing cells that could one day control glucose levels and cure diabetes, a group of investigators led by scientists at MIT and Boston Children’s Hospital say they’ve developed a promising new gel capsule that protected the cells from an immune system assault. Dr. Jose Oberholzer, a professor of bioengineering at the University of Illinois at Chicago, tested a variety of chemically modified alginate hydrogel spheres to see which ones would be best at protecting the islet cells created from human stem cells. The team concluded that 1.5-millimeter spheres of triazole-thiomorphine dioxide (TMTD) alginate were best at protecting the cells and allowing insulin to seep out without spurring an errant immune system attack or the development of scar tissue–two key threats to making this work in humans. They maintained healthy glucose levels in the rodents for 174 days, the equivalent to decades for humans. “While this is a very promising step towards an eventual cure for diabetes, a lot more testing is needed to ensure that the islet cells don’t de-differentiate back toward their stem-cell states or become cancerous,” said Oberholzer. Millions of diabetics have effectively controlled the chronic disease with existing therapies, but there’s still a huge unmet medical need to consider. While diabetes companies like Novo ($NVO) like to cite the fact that a third of diabetics have the disease under control, a third are on meds but don’t control it well and a third haven’t been diagnosed. An actual cure for the disease, which has been growing by leaps and bounds all over the world, would be revolutionary. Their study was published in Nature Medicine. The transplantation of glucose-responsive, insulin-producing cells offers the potential for restoring glycemic control in individuals with diabetes1. Pancreas transplantation and the infusion of cadaveric islets are currently implemented clinically2, but these approaches are limited by the adverse effects of immunosuppressive therapy over the lifetime of the recipient and the limited supply of donor tissue3. The latter concern may be addressed by recently described glucose-responsive mature beta cells that are derived from human embryonic stem cells (referred to as SC-β cells), which may represent an unlimited source of human cells for pancreas replacement therapy4. Strategies to address the immunosuppression concerns include immunoisolation of insulin-producing cells with porous biomaterials that function as an immune barrier5, 6. However, clinical implementation has been challenging because of host immune responses to the implant materials7. Here we report the first long-term glycemic correction of a diabetic, immunocompetent animal model using human SC-β cells. SC-β cells were encapsulated with alginate derivatives capable of mitigating foreign-body responses in vivo and implanted into the intraperitoneal space of C57BL/6J mice treated with streptozotocin, which is an animal model for chemically induced type 1 diabetes. These implants induced glycemic correction without any immunosuppression until their removal at 174 d after implantation. Human C-peptide concentrations and in vivo glucose responsiveness demonstrated therapeutically relevant glycemic control. Implants retrieved after 174 d contained viable insulin-producing cells. Two new scientific papers published on Monday demonstrated tools that could result in potential therapies for patients diagnosed with type 1 diabetes, a condition in which the immune system limits the production of insulin, typically in adolescents. Previous treatments for this disease have involved injecting beta cells from dead donors into patients to help their pancreas generate healthy-insulin cells, writes STAT. However, this method has resulted in the immune system targeting these new cells as “foreign” so transplant recipients have had to take immune-suppressing medications for the rest of their lives. The first paper published in the journal Nature Biotechnology explained how scientists analyzed a seaweed extract called alginate to gauge its effectiveness in supporting the flow of sugar and insulin between cells and the body. An estimated 774 variations were tested in mice and monkeys in which results indicated only a handful could reduce the body’s response to foreign invaders, explains STAT. The other paper in the journal Nature Medicine detailed a process where scientists developed small capsules infused with alginate and embryonic stem cells. A six-month observation period revealed this “protective bubble” technique “began to produce insulin in response to blood glucose levels” after transplantation in mice subjects with a condition similar to type 1 diabetes, reports Gizmodo. Essentially, this cured the mice of their diabetes, and the beta cells worked as well as the body’s own cells, according to the researchers. Human trials could still be a few years away, but this experiment could yield a safer alternative to insulin injections. Arturo J Vegas, Omid Veiseh, Joshua C Doloff, et al. The foreign body response is an immune-mediated reaction that can lead to the failure of implanted medical devices and discomfort for the recipient1, 2, 3, 4, 5, 6. There is a critical need for biomaterials that overcome this key challenge in the development of medical devices. Here we use a combinatorial approach for covalent chemical modification to generate a large library of variants of one of the most widely used hydrogel biomaterials, alginate. We evaluated the materials in vivo and identified three triazole-containing analogs that substantially reduce foreign body reactions in both rodents and, for at least 6 months, in non-human primates. The distribution of the triazole modification creates a unique hydrogel surface that inhibits recognition by macrophages and fibrous deposition. In addition to the utility of the compounds reported here, our approach may enable the discovery of other materials that mitigate the foreign body response. 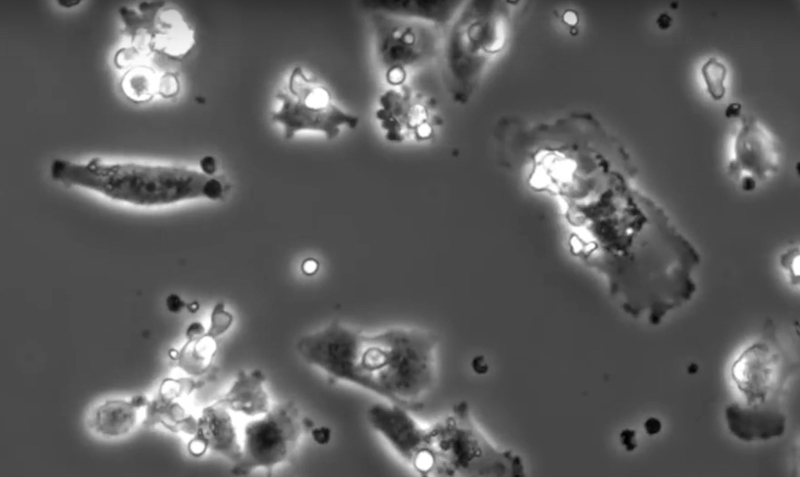 Video 1: Intravital imaging of 300 μm SLG20 microcapsules. Video 2: Intravital imaging of 300 μm Z2-Y12 microcapsules. Video 3: NHP Laparoscopic procedure for the retrieval of Z2-Y12 spheres. Patients with relapsed and refractory B-cell malignancies have responded to treatment with modified T-cells added to conventional chemotherapy, data from an ongoing Swedish study showed. Six of the first 11 evaluable patients achieved complete responses with increasing doses of chimeric antigen receptor (CAR)-modified T-cells that target the CD19 antigen, although two subsequently relapsed. Five of the six responding patients received preconditioning chemotherapy the day before CAR T-cell infusion, in addition to chemotherapy administered up to 90 days before T-cell infusion to reduce tumor-cell burden. The remaining five patients received only the earlier chemotherapy, according to a presentation at the inaugural International Cancer Immunotherapy Conference in New York City. “The complete responses in lymphoma patients despite the fact that they received only low doses of preconditioning compared with other published data surprised us,” Angelica Loskog, PhD, of Uppsala University in Sweden, said in a statement. “The strategy of both providing tumor-reductive chemotherapy for weeks prior to CAR T-cell infusion combined with preconditioning just before CAR T-cell infusion seems to offer promise. CAR T-cells have demonstrated activity in a variety of studies involving patients with B-cell malignancies. Much of the work has focused on patients with leukemia, including trials in the U.S. B-cell lymphomas have proven more difficult to treat with CAR T-cells because the diseases are associated with higher concentration of immunosuppressive cells that can inhibit CAR T-cell activity, said Loskog. Moreover, blood-vessel abnormalities and accumulation of fibrotic tissue can hinder tumor penetration by therapeutic T-cells. Each laboratory has its own process for modifying T-cells. Loskog and colleagues in Sweden and at Baylor College of Medicine in Houston have developed third-generation CAR T-cells that contain signaling domains for CD28 and 4-1BB, which act as co-stimulatory molecules. In preclinical models, third-generation CAR T-cells have demonstrated increased activation and proliferation in response to antigen challenge. Additionally, they have chosen to experiment with tumor burden-reducing chemotherapy, a preconditioning chemotherapy to counter the higher immunosuppressive cell count in lymphoma patients. Loskog reported details of an ongoing phase I/IIa clinical trial involving patients with relapsed or refractory CD19-positive B-cell malignancies. Altogether, investigators have treated 12 patients with increasing doses (2 x 107 to 2 x 108 cells/m2) of CAR T-cells. One patient (with mixed follicular/Burkitt lymphoma) has yet to be evaluated for response. The remaining 11 included three patients with diffuse large B-cell lymphoma (DLBCL), one with follicular lymphoma transformed to DLBCL, two with chronic lymphocytic leukemia, two with mantle cell lymphoma, and three with acute lymphoblastic leukemia. All of the patients with lymphoma received standard tumor cell-reducing chemotherapy, beginning 3 to 90 days before administration of CAR T-cells. Beginning with the sixth patient in the cohort, patients also received preconditioning chemotherapy (cyclophosphamide/fludarabine) 1 to 2 days before T-cell infusion to reduce the number and activity of immunosuppressive cells. Cytokine release syndrome is a common effect of CAR T-cell therapy and occurred in several patients treated. In general, the syndrome has been manageable and has not interfered with treatment or response to the modified T-cells. On the basis of the data produced thus far, the investigators have proceeded with patient evaluation and enrollment. They have already begun cell production for the next patient that will be treated with autologous CAR T-cells. Although laboratories have their own cell production techniques, the treatment strategy has broad applicability to the treatment of B-cell malignancies, said Loskog. In an effort to manage the effect of patients’ immunosuppressive cells, the investigators have begun studying each the immune profile before and after treatment. Preliminary results suggest that the population of immunosuppressive cells increases over time, which has the potential to interfere with CAR T-cell responses. The immunotherapy conference is jointly sponsored by the American Association for Cancer Research, the Cancer Research Institute, the Association for Cancer Immunotherapy, and the European Academy of Tumor Immunology. PET-CT associated with better progression-free and overall survival rates in follicular lymphoma. PET-CT (PET) rather than contrast-enhanced CT scanning should be considered the new gold standard for response assessment after first-line rituximab therapy for high-tumor burden follicular lymphoma (FL), a pooled analysis of a central review in three multicenter studies indicated.